Dr. Ben L. Reitman has sometimes been described as bi-sexual. However, I'm not sure where this has come from as of yet. 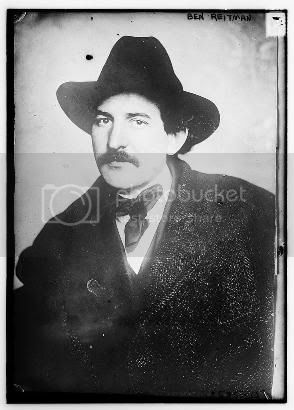 What is known as that he had a stormy love affair with Emma Goldman, who is also believed to have been bi-sexual, and that he was married four times. His daughter, Helen Reitman aka Jan Gay, was a lesbian and famous author and publicist. I've started this profile to look further into this very interesting man and see when and where his homosexual affairs came into his life, if ever. If he turns out to have been heterosexual, then he is at least connected to Emma Goldman and his daughter. Chicago, Ill., May 20 - With a real banquet to cheer their inner selves, 125 hobos gathered from the slums, nicel "flops", and barrel houses, to-night listened to members of their own fraternity discuss Dr. Ben L. Reitman's doctrine of "Kindness and no red tape." In point of novelty, few occasions have ever been witnessed that would equal it. It was the formal opening of Dr. Reitman's Brotherhood Welfare Assocation, and the lusty manifestations of unrestrained pleasure stamped the "function" an unqualified success. Preparations had been made for a hundred, but several times that number were anxious to attend, and long before the time set for the dinner to be given the street in front of the hotel was crowded with "brothers of the road." A dozen persons who contributed to the banquet were the only persons present who were not bona fide hobos. "Alexander fat" was to have been the toastmaster, but it was announced that he had suddenly taken the "bumpers" for St. Louis during the afternoon, at the request of the police. His place was filled by J. H. Drake, who told the tramps that four years ago he had been one of their number. He was attired in a dress suit, but this was forgiven by the unkempt specimens of humanity before him. There were among the crowd those who had an eye for business and did not neglect the opportunities offered by such an occasion. "Shoe String Army" Chase, a one-armed guest, utilized the interval between two courses to pass among the spectators and offer his tattered hat as a receptacle for loose change. His shrewdness won those he appealed to, and he took up a goodly collection. "Fred, the Bum," a veteran of seventy odd years, was among the first called upon when the toasts were started, the subject assigned him being, "Why I hang around barrel houses." Fred, however, was not equal to the occasion. He had apparently imbibed too freely before coming to the banquet. He strove to begin his speech, but his thoughts went astray and Dr. Reitman urged him into his seat. To take his place Fred's chum, "Canada Bob" Thompson was called upon. Mr. Thompson proved himself ot be eloquent, but he wandered somewhat from the subject. "Mr. Toastmaster, ladies and gentlemen," he began, in well-measured tones. "Shakespeare said 'They do not love who do not show their love.' I think that after participating in what you and I have participated in this evening, the least we might do is to extend our hearty thanks to Dr. Reitman." "Sid down," cried several of the fellow tramps. Dr. Reitman approached and whispered to him to talk about the barrel houses. "Forgive me if I express my heartfelt thanks—" "He ain't no tramp; he works all the time," shouted some one across the table. Several hands seized "Canada Bob" and the orator unwillingly cut short his speech. "Pittsburg Joe" spoke to the tost, "How I have lived five years without working." Variety was not lacking. Philadelphia Jack Brown, better known as the "Overland Kid" recited a touching ballad entitled "The Hobo's Dream" and Eddie Mack, "The Dancing Kid" once a vaudeville performer, contributed the song "There's a Mother Always Waiting at Home, Sweet Home." John Smith, whose features bore traces of the fourteen years he spent in various prisons, told "Why the criminal has a hard face," and "Old Man" Steers, aged seventy-six, drew the tears of his brothers in misfortune by his reasons "Why an old man cannot get a job." "I had no trouble whatever in Canada," she continued, "and those reports which have been going around are just talk. I will hold no meetings in this city, but will leave either to-night or early in the morning for the coast, where I have a large number of engagements. There is nothing to all this commotion. My husband, F. E. Keersner, was a foreigner at one time, but he became an American. San Francisco, Cal, Jan. 18 - Emma Goldman and Ben J. Reitman, arrested several days ago, are still in custody pending a settlement of the charges of conspiracy to bring about a riot. In the case of Miss Goldman bail was reduced today from $4,000 to $2,000 and Reitman's bail was reduced from $4,000 to $800. The district attorney will endeavor to present a test case to define the holding of incendiary meetings as a crime. Spokane, Wash., May 31 - Emma Goldman and her manager, Ben Reitman, came near death this afternoon, when their automobile was struck by a freight train on the Oregon Railway and Navigation Company's tracks. Emma Goldman was thrown 19 feet, landing on a sand bank. She was severely bruised. Los Angeles, May 17 - San Diego is suffering from the very worst kind of hysteria - mob hysteria, said Dr. Ben Reitman, manager of Emma Goldman today. Still weak from injuries he had received he told his story of his visit to San Diego of the frustrated attempt to lecture there of the wild automobile ride into the desert and how he was tortured by San Diego citizens. On arriving at the depot he said we were met by a mob of at least a thousand angry citizens hooting screaming and making the wildest threats. We got to the hotel safely however. At 8 o'clock in the evening we could see from the windows of our suite a crowd of 5,000 before the hotel. About 800 got into the lobby and demanded that we be turned over to them. This was refused. At 10:30 o'clock the hotel manager came to our rooms accompanied by one of the vigilantes. The chief of police wants to see you he said and I was taken down to his private office. Six men stood around the walls with drawn revolvers. They linked arms with me and hustled me out to a waiting automobile. Another machine met us, making an entire party of fourteen men who told me that they were representative lawyers doctors real estate and business men of San Diego. We drove 39 miles into the desert followed by another automobile crowded by vigilantes. The torture began then Fingers were thrust up my nose and into my eyes they stuck pencils into my nostrils, tore out hairs by the roots stuffed dirt in my mouth and applied epithets worse than I ever heard in any criminal dens in the lowest countries on earth. Out in the desert more men were awaiting us around a fire. The auto mobile searchlight illuminated what happened after that. First my clothing was torn off. Then they committed upon me fiendish gross barbaric acts the details of which are unfit to tell. Screaming with pain I begged them to kill me. No they replied. They wanted me to go away and tell of how they received advocates of my ideas in San Diego. They ordered me to sing The Star Spangled Banner. The order was enforced with blows, I cannot sing very well and at every false note I uttered I was struck in the face. Several of the blows felled me. One of the principal tormentors whom I am sure is a San Diego detective placed his face lost against mine and screamed. Were usually just ordinary business men doctors and lawyers but tonight were thugs. I stood naked in a yellow circle of white men who advanced in pairs, their eyes glittering in the searchlights to inflict pain. I have read of Indians even they could not devise more ingenious means of producing suffering than those fourteen Americans. They vied with each other in conceiving the most diabolical torture. Being of a stong physique I withstood their utmost efforts. One asked me if I believed in God? I replied that no God could permit such desperate deeds. Each of the fourteen stepped forward and propounded a question. I answered truthfully and they smashed me in the face as I spoke. Their final scheme before the burning was running the gantlet. I ran through a double row of men each beating me with a club as I passed. They got that from the Indians. Then while six held me on the ground another slowly traced figures on my back with a lighted cigar searing the flesh horribly. Their one cry was "We're Americans and we'll teach you to keep away from San Diego". I was smeared with filth and then the American flag was thrust into my throat until I strangled. After enduring two hours of torture the boiling tar was applied and desert grasses and cactus stuck to it. Then I was chased into the desert one following and beating me with my own cane until he stopped exhausted. They said they'd treat Miss Goldman the same way if they captured her. At dawn I reached the little town called Bernardo and entered it. Before turning me loose my underclothes, vest and $20 in money were given to me. I didn't get my watch or papers. I bought turpentine and these clothes (indicating the clothes he wore) washed and dressed as well as I could. We cannot prosecute Gov. Johnson has been appealed to invain. What are we going to do? The recital was made effective by Dr. Reitman's truly impressive personality. He is a man who would be regarded in any assemblage as one of unusual mental power and even culture. His career has been unique and picturesque. Starting out as a tramp he finally decided to get an education and graduated with honors from the Chicago College of Medicine and Surgery. He took a course in the Pasteur Institute in Paris and studied under Lombroso in Italy, returning to receive a post on as instructor in bacteriology and pathology at the Chicago College of Dental Surgery. However his interest in science was always secondary to his interest in socialism. An investigation of the attack upon him has been begun by the Federal grand jury at Los Angeles. A large package of documents taken from Reitman by the vigilantes has been forwarded to the United States district attorney's office here. Dr. Reitman and Emma Goldman spoke last night at the Walter Theater here. The San Diego people he said are suffering from exaggerated patriotism. Tales of IWW actions without foundation have been spread broadcast. They have beaten and paralyzed men and broken up printing plants all in paroxysms of anger. CLEVELAND, Jan 9 - Dr. Ben L. Reitman, associate of Emma Goldman, failed to appear in police court today when his case in which he is charged with circulating birth control literature, was called. His bond of $1,000 was forfeited. Reitman went to New York to testify in a birth control case there, his friends say. CLEVELAND, Jan. 10 - Dr. Ben L. Reitman, associate of Emma Goldman, returned here from New York today and was jailed on a contempt of court charge, because he was not here when his case was called yesterday. Reitman was charged with circulating birth control literature. CLEVELAND, Jan. 12 - Attorneys were arguing today over prospective jurors in the trial of Dr. Ben Reitman, charged with circulating "birth control" literature when Paul Schmidt, in jury seat number 11, addressed the judge: "May I be excused, your honor," he said. "A new baby just arrived at our home." Schmidt was excused. Asked later whether he favored birth control, he said: "I'm not sure. That makes two boys and two girls." CHICAGO, Jan 23 - Dr. Ben L. Reitman, former secretary of Emma Goldman, and advocate of free love, is married, it was learned today. He decided to say when the event occurred, but referred vaguely to a change in his ideals "a year ago". Mrs. Reitman, formerly was Miss Ann Martindale, an English woman, and supporter of Mrs. Pankhurst in her suffrage campaigns. CHICAGO - Dr. Ben Reitman, former anarchist and assistant of Emma Goldman, today is doing special work for the city at the Iroquis Memorial Hospital. Friends announced he is thru with anarchism and Ben admitted he is practicing medicine, trying to make a home and writing poetry. Chicago, April 26 - "Blood will tell - be it hobo or blue." Helen Reitman, Missouri University Journalism school coed, wearing male attire "rode the rods" into Chicago today on a Santa Fe freight train. A half century ago her grandfather, Ben Reitman, famous tramp and hobo, rode a freight into Chicago, completing one million miles on rail travel without paying fare. Her father, Dr. Ben Reitman, famous physician and hobo friend, has not seen his daughter in 18 years. Dr. Ben Reitman, social worker of Chicago, spoke before the Men's club of the Hiram W. Thomas Memorial Congregational church at a meeting Tuesday evening of this week. His subject was "Social Service." Miss Margaret Bahr, daughter of Mr. and Mrs. John A. Bahr, 6611 Washtenaw ave., was married the evening of November 26 to Louis B. Reitman, jr., son of Mr. and Mrs. Louis B. Reitman, 9848 Damen ave. The wedding vows were read by the Rev. John Leimer in the Hope Evangelical Lutheran church, 64th st., and Washtenaw ave.
Miss Ruth Bahr attended her sister as maid of honor, while James Shimek served as best man. The bride was gowned in eggshell satin and caried white roses, and the maid of honor wore blue taffeta and carried a colonial bouquet. A reception was held at the home of the bride's parents following the ceremony. Among those who entertained for Miss Bahr prior to her marriage were Miss Edna Dathe, 4206 Artesian ave., who was hostess to 35 guests at a shower at the homes of the bride-to-be; Miss Ruth Collins, who gave a luncheon for 15 guests at the Great Northern hotel; members of Alpha Phi Delta sorority, of which the bride is president, who entertained in her honor, and Mrs. Bahr. Among the guests who witnessed the nuptials were Mrs. Ida Reitman, Dr. Ben Reitman and Brutus Reitman, 424 Aldine ave.; Mrs. Olive Welfelt, 9848 Damen ave.; John F. Bahr and Elmer E. Bahr, 6641 Washtenaw ave.; Miss Ruth Collins, 7020 Paulina st.; Mrs. Anna M. Dircks, 4207 Artesian ave.; Mrs. Mary McManus, 7612 Carpenter st.; Mr. and Mrs. Arthur Main, 9821 Vanderpoel ave.; Miss Rhoda and Miss Leah Reitman, 9848 Damen ave.; William Sheeley, Clair Mair of Wilmette; Miss Hertha and Miss Elenore Moller, 2316 Kenilworth ave., and Glenn Willing, 7138 Ellis ave.
Others who attended were Dave Buchard of New York; Miss Ann Gaverski, Otto Phernsdorf of the Crest hotel; Miss Francis Gressle, Henry Schneider, 6547 Washtenaw ave.; Miss Edna Darthe, 4206 Campbell ave.; Miss Katherine Moriarity 4148 Artesian ave.,; Miss Rossetta Barret, 3523 Seeley ave.,; Miss Renita Karston, 3218 W. 62nd st.; Miss Ann Mersky, 3980 Archer ave.; Miss Fay Johnsen, 3337 Western blvd; Miss Mary Collins, 3537 Seeley ave,; Miss Bess McFarland, 2664 W 39th pl, and Arthur Maast. Louis B. Reitman, 64 years old, 9821 Vanderpoel ave., who died last Thursday, was buried Saturday in the Evergreen cemetery after services in the chapel at 2324 W. 111th st. Mr. Reitman, son of Mrs. Ida Reitman, was raised in St. Paul and had been active as an advertising man before he became ill about two years ago. Surviving are his widow, Clara; their son, Louis B. Jr.; three daughters, Mrs. Ruth Main, Mrs. Rhoda Kuster and Mrs. Leah Shely, and a brother, Dr. Ben Reitman. Chicago, Nov. 16 - Dr. Ben Reitman, founder of a hobo college, associate in anarchism with Emma Goldman and proponent and founder of other "ism" groups in Chicago in the last three decades, died of a heart attack tonight in his home at 6826 South Bishop Street. He was 63 years old. Dr. Reitman was a practicing physician since his graduation from the Chicago College of Medicine and Surgery in 1904. He was a one-time member of the City Health Department and one of the founders of the Dill Pickle Club, rendezvous of Bohemians. Only last Armistice Day Dr. Reitman gathered some twenty-two of his followers in Social Science Hall, where he eulogized the anarchists who died on the gallows for their part in the Haymarket riot. He told of his association with Emma Goldman - "ten years her manager and janitor." His hobo college opened some twenty years ago on West Madison Street, was moved to a hotel on Grand Boulevard and the doctor once took some 500 of his hobo friends to a sumptuous dinner in a Loop hotel. Dr. Reitman was born in St. Paul., Minn. He leaves a widow, Medina; a son, Lieutenant Ben M. Reitman of the Army Air Force Ferry Command, and four daughters, Mecca, Victoria and Regina, who live at home, and Jan of New York. Middle Ida Head April 1860 married 2 Poland Poland Poland 1870 . Wittlesle? de la Ida Wife 50 married 4, 2 living Russia Russia Russia . Reitman Anna Wife 36 married England England Germany . Reitman Brutus son 2 single Illinois Minnesota England . Reitman Anna 44 31 England England England .